Yes boots-possibly the most important element of the hillwalkers attire. Whether the temperature is sub-zero or the sun is splitting the stones one must have boots. Layers may increase or decrease with the season, hats and gloves might or might not be freed from the backpack, but boots are ever present. I did the Four Peaks Challenge last year and I needed my boots. I was doing it on my own for charity. Everything was set up-a friend was driving, free accommodation was sorted, a company even covered the fuel. What could go wrong? Boots could go wrong. The Devils Ladder on Carrauntoohil told my boots to wake up...then Mweelrea harshly yelled at them…next Donard roughly shook them awake. 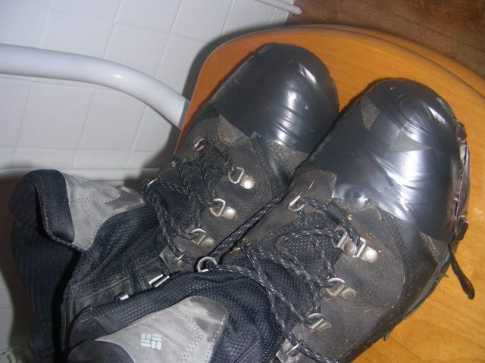 Shook them too hard as the photo will show- I had to tape them up for Lugnaquillia. But the tape fell off and I used my street wear Cats to complete the weekend. Needless to say I changed brand, but even these super seamless boots I currently wear are starting to let in water.